In 2009 I landed my dream job, building the London 2012 Olympic Legacy Programme. I was working alongside the government and professional athletes to create sustainable change across East London. Then my husband asked me to move to Johannesburg. I was initially reluctant (to say the least) but little did I know that leaving that job and my London life, to move to Joburg, would be the catalyst for the best 5 years of my life. I quickly became pretty lost and yearned for a new identity. I couldn’t get a ‘normal job’ due to work restrictions so I had nothing to get me out of bed, no purpose and no inspiration. I missed the water cooler work moments, I missed spontaneous after work drinks and I missed the routine. I couldn't stop thinking - this is meant to be brilliant, whats wrong with me, why aren't I enjoying having all this freedom? Something had to change. I was forced to strip back my idea of what a meaningful life was supposed to look like, and redefine my own personal worth, especially challenging society’s obsession with “doing, achieving and accumulating”. The first step in redefining my own self-worth, was to challenge this view. There had to be another way I could value myself, a value that had nothing to do with how busy or productive I was, and everything to do with WHO I am, and how to choose to feel and view life on a daily basis, just one step at a time. My purpose could be as simple as choosing to be happy each day, and make the most out of the opportunities available to me. After all it is scientifically proven that happiness is contagious, lifting overall wellbeing of your wider social circle. When you give yourself permission to do thing that make you smile (even if thats doing nothing at all), it will increase not only your happiness, but those around you too. That sounded like the sort of thing I would like to be known for, and I think was once known as by childhood friends. I started with my weekly schedule, and added (and noted) in activities based on what would make me smile, and stopped doing those that pulled me down or left me feeling empty. Next I started to rebuild my own personal brand, to ensure that I could evaluate opportunities based on my own values, rather than a corporate view. I am not sure what it is that makes you happy, but you SHOULD know is your Self-worth has to start with self- awareness. In my opinion asking questions (of yourself or others) and diarising what you fill your time with is the best way to achieve this. When you become more self-aware, figuring out your values becomes much easier. Only then can you start becoming intentional about finding activities that bring meaning/ purpose/ worth/ happiness. These activities take on purpose for us, they are not selfish luxury, or unobtainable dream, but things that keep us sane, vital for our wellbeing, which in turn brings out the best in those around you too. Making simple changes to the way you view yourself, your value and daily activities it is possible to gain a sense of purpose and value, no matter which job role, country, or house you find yourself in. Want a hand to put your Personal Brand together? 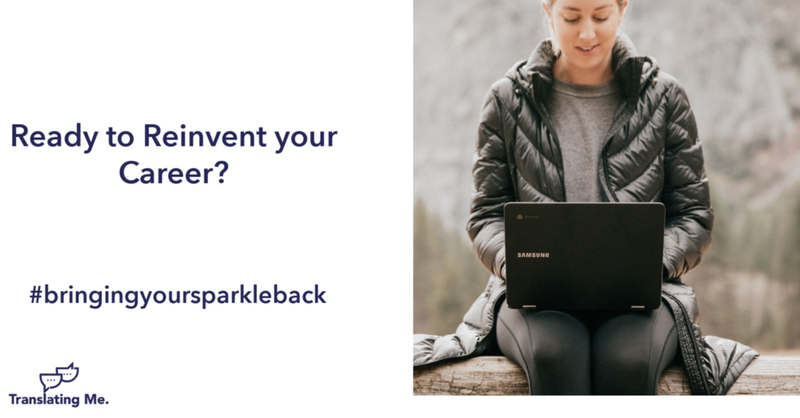 We can help you bring back your sparkle, and work out whats next for you and your career, through our Global Intern programme. Click the image below to learn more.